Discover self-catering holiday cottages and apartments in Sheringham, Norfolk. Sheringham is an attractive seaside resort centered on a bustling high street with a neat clock tower at one end and the seafront at the other. It still has a small fleet of fishing boats that go out after lobsters and crabs. There is a lifeboat station at the western end of the prom that can be visited between Easter and September. The town also has the terminus of the North Norfolk heritage railway and is well-placed for visiting other resorts along the coast including Cromer, Cley, Blakeney and Wells-next-the-Sea. Click on the property links for more details and booking information. A nicely-presented, comfortable and well-equipped semi-detached cottage in a peaceful location with attractive views over a common, close to the centre of Sheringham. This pretty and well-presented cottage close to Sheringham town centre and beach with views over Beeston Back Common. It has a woodburner in the lounge and a courtyard garden. This large comfortable town house is a short walk from Sheringham beach. It has an open plan dining area with a woodburner, and the back garden is landscaped and has a patio. There is parking for up to three cars. An attractive, spacious and well-equipped cottage set in a courtyard, close to all the attractions of Sheringham. 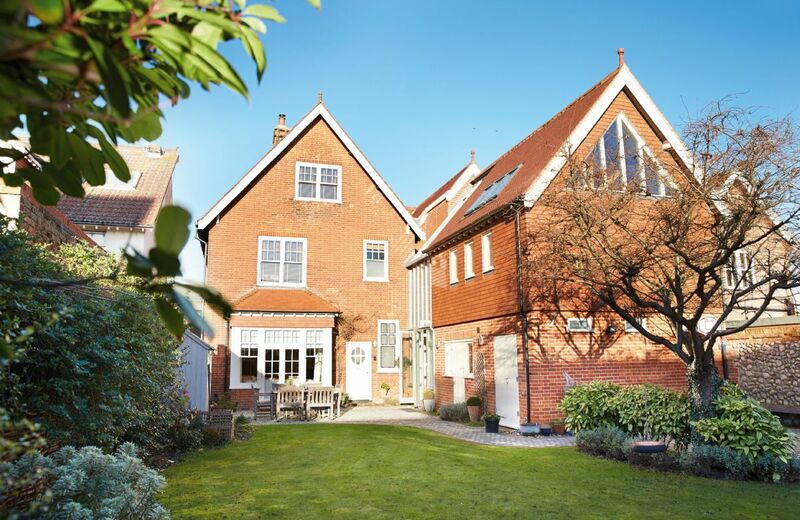 Impressive sea views from this terraced house in the centre of Sheringham. The property is triple-glazed and has gas central heating. It also has an enclosed garden with courtyard and terrace. Flint cottage only a short stroll from the beach and town centre. The cottage is nicely decorated and has a spacious lounge, three bathrooms and conservatory.